Every so often I am asked about the favorite part of my job. My mind quickly scrolls through a slide show of vivid memories of the things that are most dear to my heart − fields during a sunset with beautiful clouds and unimaginable colors, the smell of the first rain, the whistling and chatter of a crew working as a team and the sight of Farm Fresh To You boxes in random kitchens and door steps. 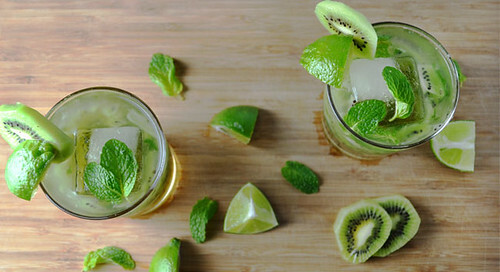 We think mojitos are pretty delicious as they are, but adding in kiwi takes it to a whole new level. In a food processor or blender, puree the kiwi and mint leaves until smooth. Divide the puree among two glasses. Stir in the simple syrup, lime juice and rum. Add ice and top with club soda or sparkling water. Garnish each glass with mint leaves and slices of lime and kiwi if desired. Enjoy! Note: Remember 1 ounce is equal to 1 typical shot glass. To make your own simple syrup, dissolve 4 tablespoons sugar or honey in 1/2 cup boiling water. Let cool. How To Add Kiwi Mojito Ingredients To Your Delivery: CSA members - head on over to our online Farm Stand Market to customize your upcoming delivery. The Market is open from noon on Thursday until 10 am, 2 days before your scheduled delivery day. After you confirm your produce items, click the orange button "Confirm and Continue To Other Farm Products" to add the products to your delivery. I’m Mexican and in my culture, like many other cultures, you gather the people that you love the most around you, and you feed them. 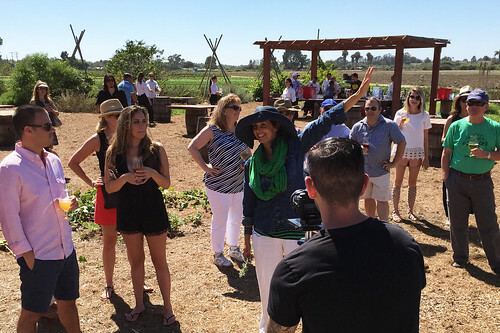 Our farm provides the ingredients for everyone to do just that. 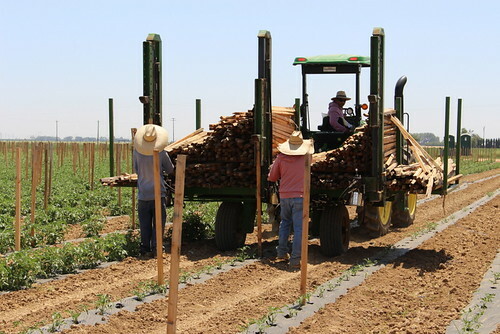 We call our customers our “farmily” – we love growing food that feeds them and their families. We really can’t do it without them. Without our customers, including those who get our produce in their Farm Fresh To You boxes, all we’ve got is compost. 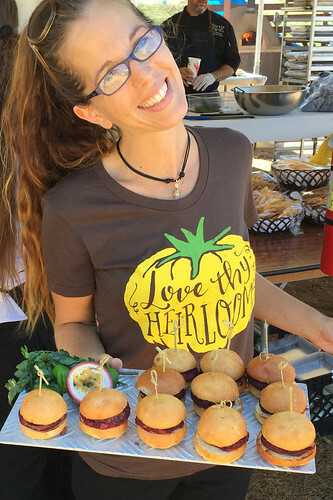 We want to cultivate relationships with our customers and nourish each other. 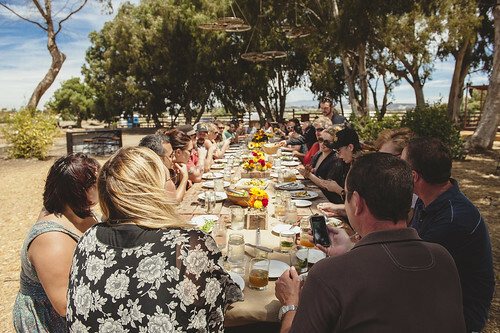 We will gather together to break bread for our second annual summer feast with our Farm Fresh To You circle on Saturday, July 30th, at our farm in San Diego. Farm Fresh To You is an important partnership for us. In fact, it helps us stay in business. It gives us stability. If we know we can grow radishes and harvest them and definitely have a place to sell them, we will have seed money for the following week. 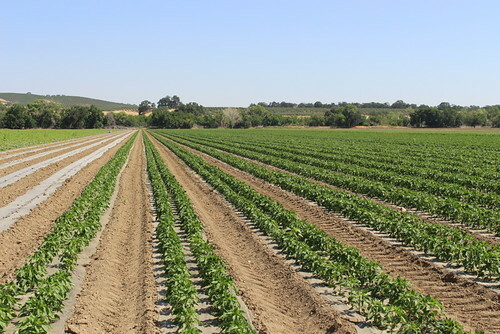 Farming is a volatile business, but a dependable sales channel helps us tremendously. Chef Jeff Rossman of Terra American Bistro is returning for this year’s dinner. He is a chef truly dedicated to the movement of knowing your farm and where your food comes from. For us, these dinner are about feeding the spirit and the soul. We look forward to seeing you there. Few things taste like childhood summers like the flavor of wooden popsicle sticks, stained and chewed nearly to splinters in an attempt to extract every last drop of frozen goodness. The flavor of not worrying how many calories you’re consuming. Of not caring about the sticky stains on the front of your shirt from a popsicle that’s melting faster than you can eat it. Of not wondering how much your electrical bill is going to be every time you hear the air conditioner kick on. Mmmm, tastes like freedom. 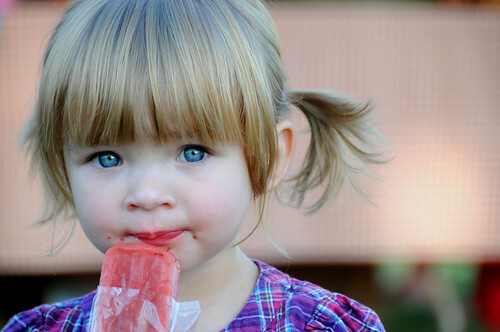 Bring back the flavor of childhood with popsicles made from farm fresh produce. The zing of apricot and honey, the buzz of coffee and cherry, and the cool freshness of mint and cream are a modern twist on a classic confection. Whip up a few batches and stock your freezer with sweet memories this summer. Popsicle molds come in a variety of shapes and sizes and can be purchased in kitchen stores, as well as the kitchen section of many large retailers. Our favorites include the Norpro Ice Pop Maker and the Utspadd silicone ice pop molds. Each of the following recipes make about 6 to 8 popsicles depending on the size of the ice pop mold. Freeze leftover sweetened condensed milk in a mason jar to use for future recipes. Hope you enjoy! Blend all ingredients. Fill popsicle molds and freeze for several hours. Consider using figs in place of apricots later this summer when figs are in season. Blend milk, cream, and sweetened condensed milk. Stir in strawberries. Fill popsicle molds and freeze for several hours. 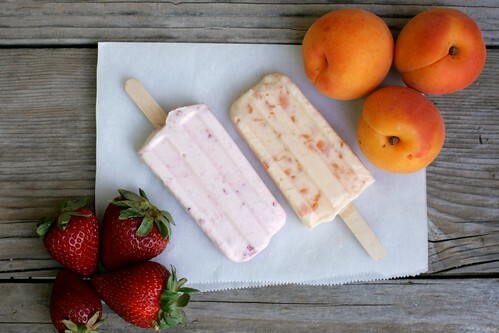 For Peaches & Cream popsicles, use 2-3 ripe peaches in lieu of strawberries, plus ¼ teaspoon almond extract. In a mixing bowl, grind sugar and mint leaves with a wooden spoon for several minutes to release oils from mint. 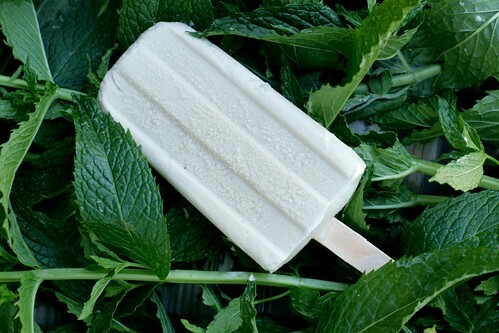 The sugar will take on a greenish hue and the mint will break down into smaller pieces. Add cream and milk. Stir to dissolve sugar. Place mixture in the refrigerator for several hours, or overnight. Strain mixture and discard mint. Fill popsicle molds and freeze for several hours. Combine yogurt, sugar, and amaretto and stir to dissolve sugar. 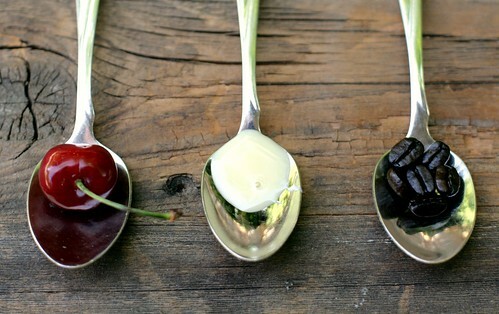 Stir in cherries. Fill popsicle molds and freeze for several hours. In a blender, combine all ingredients. Pulse until ingredients are mixed, leaving some small chunks of cherries. Fill popsicle molds and freeze for several hours. 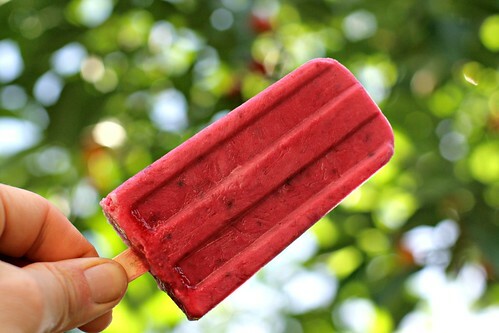 How To Add Popsicle Ingredients To Your Delivery: CSA members - head on over to our online Farm Stand Market to customize your upcoming delivery. The Market is open from noon on Thursday until 10 am, 2 days before your scheduled delivery day. After you confirm your produce items, click the orange button "Confirm and Continue To Other Farm Products" to add the products to your delivery. communication sounds. This was becoming a routine in that tree - enough of a routine to send me into the house to grab my binoculars. I quickly found one of the hawks sitting on her nest! The nest was placed in the crook of a thick, oak tree branch located almost at the top of the tree. Coincidence placed the nest in a small break in the oak leaves, giving me a great view. Put all the ingredients into a blender or food processor and mix until smooth. Pour into a glass and enjoy. 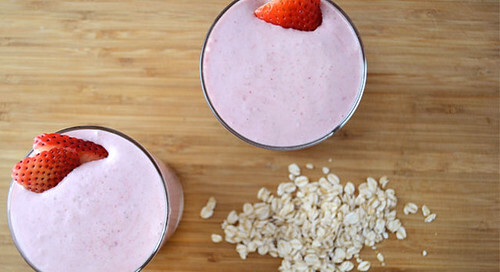 How To Add Strawberry Oatmeal Smoothie Ingredients To Your Delivery: CSA members - head on over to our online Farm Stand Market to customize your upcoming delivery. The Market is open from noon on Thursday until 10 am, 2 days before your scheduled delivery day. After you confirm your produce items, click the orange button "Confirm and Continue To Other Farm Products" to add the products to your delivery. It has been my experience that the changing of the seasons is gradually hinted at and then the next season is quickly blown closer with a stiff wind. Last week was no exception. The green grass of the hills and moist soil of spring all but disappeared in a few days. A steady, dry, north wind arrived for a several-day visit. Howling at night, it made our roof whistle. It moved everything that was not securely fastened. The wind settles an uneasy feeling in my bones, leaving me to wonder deep down what is happening outside that is out of my control. We escaped these days with little damage. 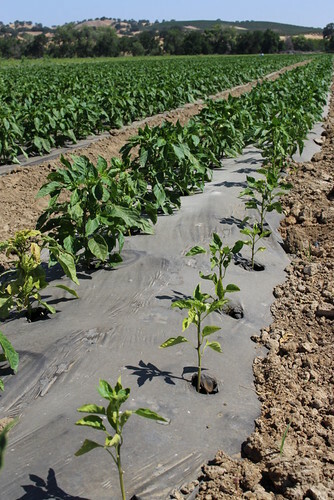 The recently transplanted tomatoes, melons, peppers and eggplant had sufficient time to get their little roots far enough into new soil to secure enough water to battle the wind. The only trees that fell were old, or they only dropped a branch or two. No hay was cut, and lying with roots still holding in place, it escaped sabotage. When the calm days with blue skies returned, the hills where no longer green, but on their way to golden. The whole farm breathed a sigh of relief, took a long draw of water and started growing like crazy. Tomatoes are visibly increasing in size by the day. The rush to get stakes into the field and keep up with the stringing is on. 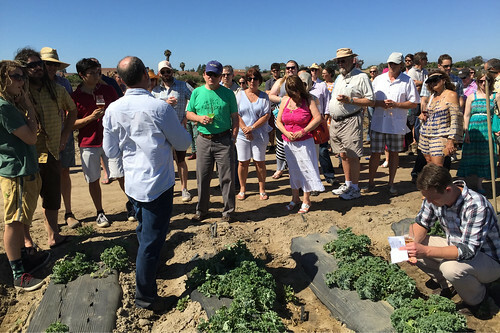 Our spring vegetables are increasing ingredients by the day, and we are working to stay on top of the timely harvest of lettuces, radishes, beets, bok choy and carrots. The ground squirrels were out in force and in the creek under the setting sun, I spied a big old coyote who was fat from his diet of the squirrels and rabbits. The oak tree leaves are no longer light spring green, but have settled into their dark summer green. The canal is flowing as full as I have seen it in four years. 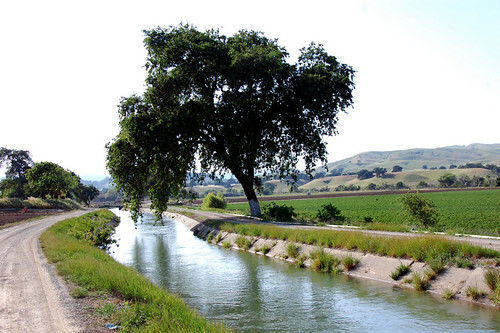 The whole farming community is excited about a full allocation of water. If the asparagus harvest was not still going, I would say summer had arrived. This week we are excited to announce our newest coffee offering from Pachamama Coffee Cooperative, Espresso, which is currently available through the month of May in your online farm stand. This organic Espresso is carefully blended with their farmer's best Latin coffees, and a touch of Ethiopian to give it a bold flavor that still has complexity for the discerning palate. It stands up well in milk based drinks, but this roast is equally delicious brewed up long via pour over coffee, or even a drip coffee maker. 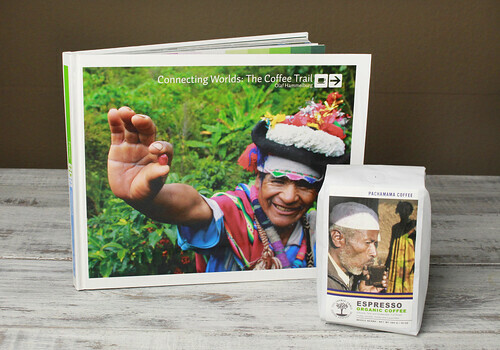 To commemorate the occasion, we are giving away a bag of organic Espresso coffee and a copy of the book Connecting Worlds: The Coffee Trail by Olaf Hammelburg, which depicts the journey from farmer to consumer. See details below. We are well into Spring and rejoicing for the mild warm temperatures. Our recommendation for the upcoming warm weather is to grind your coffee coarse and make cold-brewed coffee. 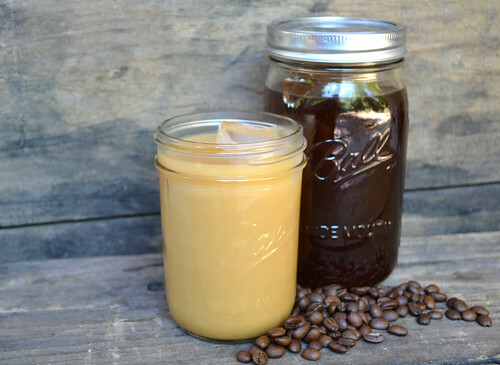 This iced coffee is so refreshing and easy to make. Bonus: No coffee maker needed. In a large jar with a lid, pour the coffee grinds in. Fill with approximately three cups water and refrigerate overnight. Place a colander inside a large bowl. Pour the coffee into the colander and let it drain. You can also put a coffee filter in the colander for extra filtering. Pour the filtered coffee back into a jar. Get your favorite glass and fill with ice. Pour the cold brew coffee over the ice and stir in milk or milk alternative if desired. If you want to put sugar in your coffee, fill a small saucepan with a few tablespoons of water. Bring to a boil and quickly stir in the sugar until it melts. Stir the simple syrup into your iced coffee. To win a copy of Connecting Worlds: The Coffee Trail and a bag of Pachamama’s Espresso coffee, simply leave a comment below answering this question by Monday, May 23, 2016 (one entry per-person please). What Is Your Coffee Ritual? No purchase required. Limit one entry per person, please. Entries will close on Monday, May 23, 2016. Winners are chosen by Random Number Generator and announced on our blog on Monday, May 23, 2016. Thank you for all the amazing and thoughtful comments! One thing is apparent, our customers appreciate their morning coffee ritual. "Our favorite coffee ritual includes a light to medium freshly roasted and and freshly ground coffee. We use a beautiful hand made Costa Rican "chorreador" which is a simple way to make pour over coffee. It is used by most Costa Rican's daily. We have a fancy Italian espresso machine, but we found that pour overs give the best flavor. It also reminds us of our beautiful honeymoon where we drank the best coffee of our lives! It was always freshly roasted and right from the farms! We found that the best coffee does not need any milk or sugar and wont affect your gut." The grass on the hills is still lush green from the rains a few weeks ago. The clouds that have been floating overhead have added a contrast to the farmland that is a beautiful part of spring. The clouds always come from the west, and they often leave huge shadows on the ground as they move east. There have been a few of them that have dropped quick bursts of rain, but nothing significant, just enough to remind us that summer is not here yet.